The MERIT program is the KCI’s premier technology-focused professional development program. MERIT is a research-based, educator development program designed to help teachers bolster their curriculum with technology-enhanced learning activities to motivate, challenge and inspire the diverse learners and leaders of the future. MERIT is a year-long program that starts each spring, includes a two-week intensive summer institute, and continues with follow-up classes in the fall and winter quarters. View longer version (6:30 min). The MERIT Program seeks to show through qualitative and quantitative measures that engaging technology in the hands of a well-trained teacher can improve student learning. Participants have the opportunity to learn to use and contribute to a variety of resources for collaboration, and are required to design projects not simply to provide dynamic learning experiences for their students, but also create open educational resources that will be of value to other teachers and students near and far. Participants are diverse and range in age and experience with technology. While the program is open to teachers of a variety of disciplines, the program includes a special focus on math and science, where there is a significant need in so many schools to help students develop confidence in and excitement for their future possibilities with these subjects. In helping to make learning and teaching more dynamic, MERIT is working to bring education out of the past and into the future. Accepted MERIT cohort participants, who are California residents (must be a resident of California for at least 12 months before May orientation date) and who complete all the requirements of the two-week Summer Institute, receive six Foothill College quarter units (continuing education units), a $400 stipend, and a tool or app to enhance their projects. All incentives are designed to support the ongoing integration of technology into the curriculum, and by following through with fall and winter academic classes, training, activities, and project implementation, participants will receive an additional $800 stipend (California residents) in March of the year following the Summer Institute. These activities include helping other teachers learn to integrate technology meaningfully and therefore allow the benefits of the MERIT Program to spread well beyond the classrooms of the participants. MERIT is a year-long program starts each spring, includes a two-week intensive summer institute, and continues with classes in the fall and winter. 10-Month Program: starting on Saturday, May 11, 2019 (orientation) and finishing with graduation in March 2020. Follow-up Saturdays: four sessions, to be scheduled during Foothill College's Fall and Winter quarters. Northern California public school educators are highly encouraged to apply for a place in MERIT. The MERIT program also accepts private and charter school applicants, as well as applicants from all over California. (California teachers should be California residents for at least 12 months prior to the May orientation to receive units and stipend.) International applicants are encouraged to apply. All participants must provide their own housing and travel. Applications will be accepted 11/26/18 through 1/26/19. We encourage all interested teachers to submit their applications as early as possible. Applications are due no later than January 26, 2019 by 11:59pm . I'm an International teacher. Can I apply? Yes, a few places are reserved for international participants who live and teach outside the USA. Use the same application form. There is no stipend or units offered for non-California residents. What is the typical profile of a MERIT teacher? Historically, the significant majority of successful applicants taught in grades 4-12, in all subjects, and in a public school in Silicon Valley. For the last three years, half the participants taught in STEM disciplines. There are many reasons why this profile has developed. Keep reading the FAQs for more clues. Do I have to be a classroom teacher? MERIT is a donor-sponsored program and the donors stipulate that the program support active classroom teachers directly. While most applicants will be classroom teachers in K-12 schools, others, such as librarians, art educators, media specialists, administrators, etc., and community college instructors may also be candidates for participation. The program is designed for classroom teachers, in that it is focused on large-group, long-term applications of technology in a school setting. Do I have to teach a certain subject area or grade level or in a certain area? The KCI seeks applicants from all grade levels and all subject areas, and follows a strict non-discrimination policy. What are the benefits of participating in MERIT? We believe the principal benefits of the program will be the chance to enhance your teaching in dynamic ways using the tools and techniques you learn, as well as the collaboration you have with the other members of the cohort. Individually, those who properly complete the program also will earn at least ten units of continuing education units, a tool for the classroom (i.e., app or device), a stipend check following the summer program (CA teachers/residents only), and another check in the spring (CA teachers/residents only). These payments are made by check to participants for the full amount and are noted as "financial aid". You should consult with a tax adviser or consultant regarding declaring it as income. 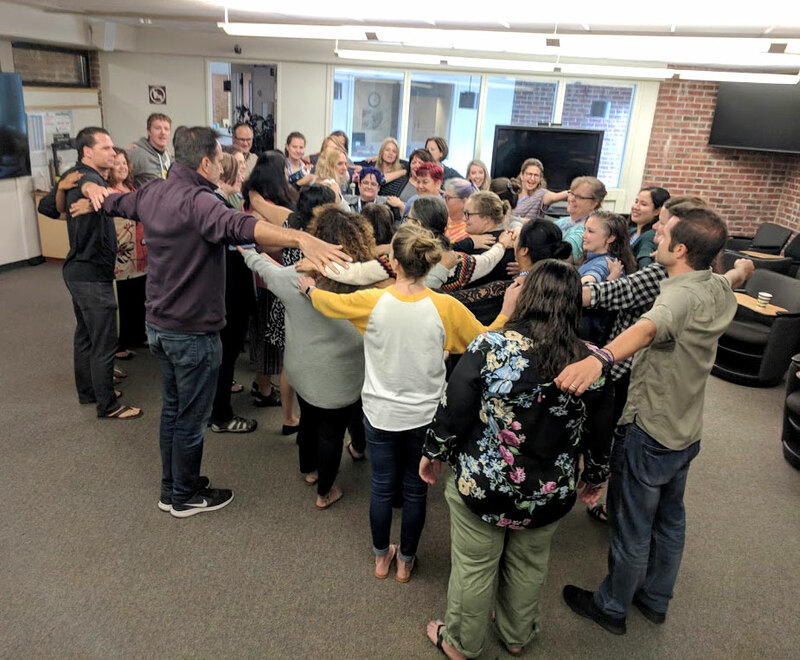 NOTE: The stipend for California residents in the MERIT 19 program is $1200 total = $400 after completing the summer intensive and $800 for completing the follow-up classes and additional coursework by the last follow-up in March 2020. This is too good to be true! What will MERIT cost me, really? You're right, MERIT offers loads of benefits to participants. Full disclosure coming up...MERIT teacher participants are expected to partner with the KCI in paying for some of the costs of the professional development units. For California participants (must be a resident for at least 12 months prior to the start date), MERIT will pay for 6 units (CEUs) in the summer, and participants themselves pay for the other 4.5 units taken in Spring, Fall, and Winter. At current Foothill College rates the total cost for the 4.5 units over three quarters is about $350. Non-California participants may pay for units if they wish, using the rates for out-of-state or international students. Fees may go up for next year. Additional costs include parking fees of $3 per car per day. MERIT will pay all your parking fees for the summer institute and participants pay for parking on all other class days. What classes do I need to take for MERIT? Start by looking at the PDF copy of the application. We suggest that you take your time working out your answers to each question, making sure you check spelling and grammar, and keep to word limits where asked. You will also need to have your principal fill out a form by the application deadline pledging to support you in your efforts to make innovative technologies a meaningful part of your teaching. Finally, access the online application form, and paste your answers into the appropriate fields. Note that you will not be able to save a partially completed form; once you submit the form, the application is in our hands. If you have questions, you can send them to Lisa DeLapo (gro.retnecnoitavonniesuarknull@opaledl) and should get an answer within two to three business days. Applications are scored and calibrated to a common rubric by a variety of people including MERIT graduates, instructors, and administrators. Your name, school, and district are not included in any part of the scoring in order to assure anonymity and objectivity. Applicants who follow the directions and adhere to the word limit on open-ended questions score higher. I am applying with one or more colleagues from my school. How do I let you know this? You will put the name(s) of anyone with whom you are applying in the appropriate text box in the online application. Note that you will each need to apply separately (and with UNIQUE applications - do not put the same answers). It is possible that not all members of a group will be selected to participate. Should I partner with someone of the same subject, grade level, etc? We do believe that being part of a team strengthens the chance that you will be able to share what you learn as part of MERIT with others at your school. Who you choose, however, is up to you, and should primarily be a function of your ability to work together productively. Do my chances for acceptance increase if I apply with a partner? Yes, there is a bump in the score of those who apply with others, as long as those identified also properly finished their applications. I am applying alone. Will it be possible to create partnerships during the program? Yes. We are confident that you will be able to collaborate with one or more of the other participants. The deadline is January 26, 2019, by 11:59pm. Neither Foothill College nor the KCI will be responsible for any technical problems you have submitting the form. We encourage all interested teachers to submit their applications as early as possible. What else am I committing to doing if I am selected to be in the program? The basic requirements for all applicants are outlined in the Requirements of Participants page. Can I still participate in the Summer Institute if I am not accepted? No, but a waiting list is automatically created for those applicants who scored near the threshold for acceptance. If a spot opens up ahead of you, it is possible you will be offered the chance to participate as a member of the cohort. When is the Summer Institute? The two-week summer program will be the ten weekdays from July 8 - July 19, 8:30am - 3:30pm, and orientation May 11, 2019. If you are accepted and find that you will need to be gone during any part of that time, we ask that you let the KCI know immediately so that we might offer your spot to someone else. If you live outside of the San Francisco Bay Area and will be lodging near Foothill College for the Summer Institute, we recommend you arrive no later than the Friday before the start of the summer institute and leave no earlier than the Saturday after the summer institute. In the past, we have been able to help those arriving by plane get from nearby airports to their hotel. While we plan to do this again, we cannot guarantee it. The program is scheduled to be held at the Krause Center for Innovation on the Foothill Community College campus at 12345 El Monte Road, Los Altos Hills, CA 94022. I understand that I will need to take FASTtech classes as part of MERIT. How do I find out about them? This is specific to participants from California. There is more information on the KCI FASTtech web page. What kind of online tools should I know before I begin the program? In terms of prerequisite knowledge, you only need to be able to use email. The preparation course that participants are required to take in the spring will introduce the collaborative tools necessary to do the work required, such as Google Docs, Sites, Forms. As you are introduced before, during, and after the Summer Institute to various other learning and collaboration tools, you will be expected to work to master them quickly. It is our belief that anyone who genuinely wants to learn a given tool and puts forth the effort to do so will be able to learn what is needed. Do I have to attend the follow-up sessions in the academic year? I'm ready! How do I start? Go to the questions in the application and prepare them carefully. Follow the instructions there, and when done, enter the information in the proper application form on the same page. Make sure your principal does his or her part by submitting the form supporting your application. Good luck! I applied for MERIT, but have not received any confirmation you have received it. While we can easily see that an application is submitted, that confirmation is not an indication of a complete application or any type of preliminary review. Please contact us at gro.retnecnoitavonniesuarknull@opaledl for inquiries about your application. I applied for MERIT, now when do you expect the first round of decisions to be made?